If we could incorporate arts and crafts into every part of our day, we would!! I love doing reviews for art products and have found a unique product from the The Pencil Grip, Inc. These are a solid tube of non toxic tempera paint. They look much like a marker on the outside, but the inside is more like a dry crayon. I didn't even know paint could be in a solid form like this! I do enjoy getting water color paints out for my 2 year old, but she has to do it with much more supervision and protective measures (for my table and floor), that when she was able to use the Thin Stix. The older kids get to paint often, they are big into using easels and watching videos and painting shows. My little one is always disappointed that she can't paint like the big kids. I chose to let her be the sole user of the Thin Stix and she was thrilled that they were 'her paint'. The classic colors are perfect for her and the learning she is doing with basic colors. She can not only use them for fun art projects, because she is so young we can utilize them for color matching and coloring worksheets as well. We weren't sure at first just how 'messy' they would be so we took her outside and put up paper for her to do her artistry. These are a great size for her little hands. I like how they are thin, and she can begin being trained in how to hold pencils. She is actually into making smaller details when she draws, so the thinness of the Thin Stix was helpful for her to 'write' her list she was making. The caps are easy for her to get off and on herself, making her feel a little more self sufficient in her creating. She also can spin the bottom dial to get the Thin Stix to roll our more paint. This was one thing she needed monitored with as she would try to roll it all of the way out! No problem though, we just rolled it back down. There was no worry of mess once we got started. The paint dries within 90 seconds. There was no smearing, no mess, no paint all over her hands or clothes. Once we tested out the No Mess theory, and were successful, we let her go to it on creating inside! What a huge blessing for this sweet darling to be able to just sit and paint like her older siblings. 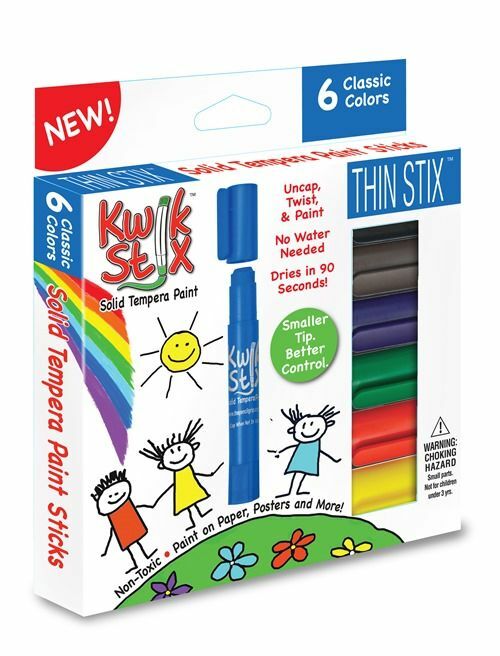 The Thin Stix 6pk of Classic Colors was perfect for my toddler. She had no mess, no trouble using them, and was able to easily put them back in their box for later use. The Pencil Grip, Inc., also sells these in 12 and 24 packs. They also have metallic and neon colors. My older kids have been chomping at the bit to try these Thin Stix. I wanted these to be special for my toddler, but I am planning to purchase the larger set for the older kids to use. This is a product all homeschoolers should have in their art supplies. See what my fellow crew members thought of the Thin Stix 6pk Classic Colors by clicking on the banner below.